The Peachtree Miter T Track and T-bar Combo Set is one of the most versatile track sets you will ever buy. Ideal for shop built router tables, band saws, drill presses and much more. The Miter T Track accepts a standard 3/4" x 3/8" miter gauge bar. Most miter gauges have a t-bracket or disc on the end to prevent accidentally lifting out of the miter slot when in use. Our Miter T Track will accept most miter gauges with the t-bracket or disc as well. This makes the Miter T Track unique all by itself. Throw in the T-bar and your possibilities are almost limitless! The T-bar slides smoothly into the Miter T Track. This gives you the ability to create jigs and fixtures of most any kind. You can create fixtures for your feather boards, stop blocks, hold downs and more. Not only does the T-Bar work with the Miter T Track, it will also slide into the miter T slot of most table saws for building all types of sliding sleds or fixtures. Our Miter T track & T-bar are made 100% in the USA and come with full installation instructions.The Miter T Track and T-bar measures appx. 48" (length is approximate and may slightly vary). Ideal for shop built router tables, band saws, drill presses and more. Miter Track accepts a standard size miter gauge bar with its standard 3/4" x 3/8" t-shaped slot. Use the T-bar to build all types of jigs, fixtures or sliding sleds for your shop. 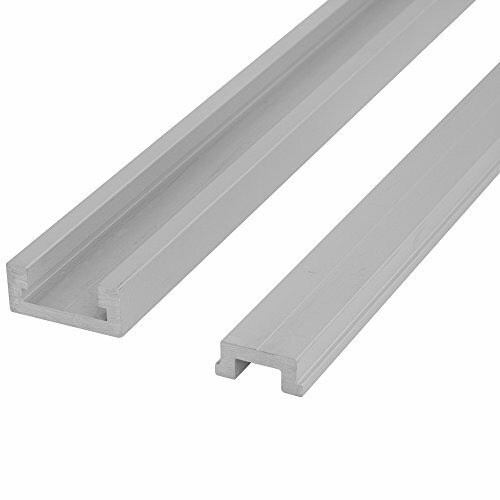 The thick walled,heavy duty miter track and T bar is made in 100% the USA. and measures appx. 48"
If you have any questions about this product by Peachtree Woodworking Supply, contact us by completing and submitting the form below. If you are looking for a specif part number, please include it with your message.